Oil on panel signed and framed. Dedicated and located at the bottom right. 35 x 27 cm without frame. 49 x 41 cm with frame. 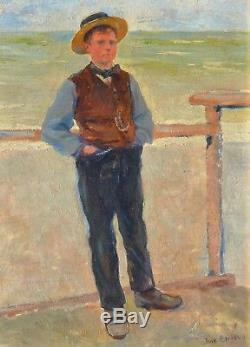 Charming painting of this painter of the French school of the late nineteenth century and early twentieth. We know very little about him, except that he was born in Joliville-le-Pont, not far from Paris and that the Museum of Fine Arts in the city of Paris has a work. More photos and information on request. 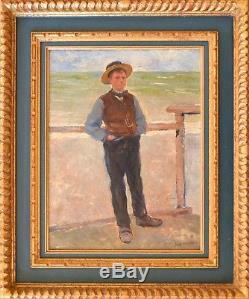 The item "beautiful framed painting.Young man with the boater J.
Purville Normandy" is on sale since Thursday, February 8, 2018. It is in the category "art, antiquities \ art of the nineteenth and before \ paintings, enamels ". The seller is "marceille24" and is located in marseille.